On this block sits a one-story shotgun house with a modest “A”-frame structure. Two parts comprise the home’s street facing façade: a window centers the right half, while the left half indents inwards towards a front door. White paint unites the entire house’s exterior; this paint also covers and accents the horizontal wood beams that adorn this house. Nine other nearly identical replicas—more one-story white “A”-frames—surround this house. 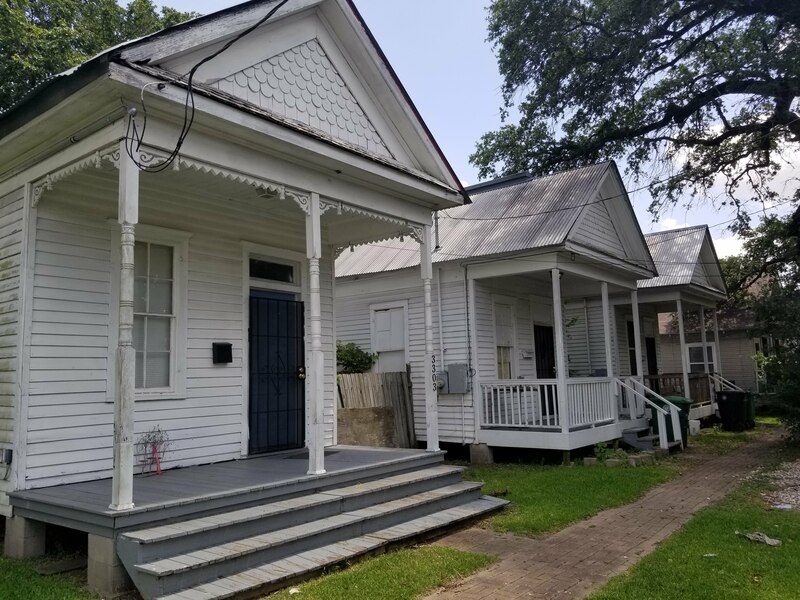 In this near uniformity lies a story about the inception of these homes, and their continued meaning making in Houston’s Third Ward neighborhood. 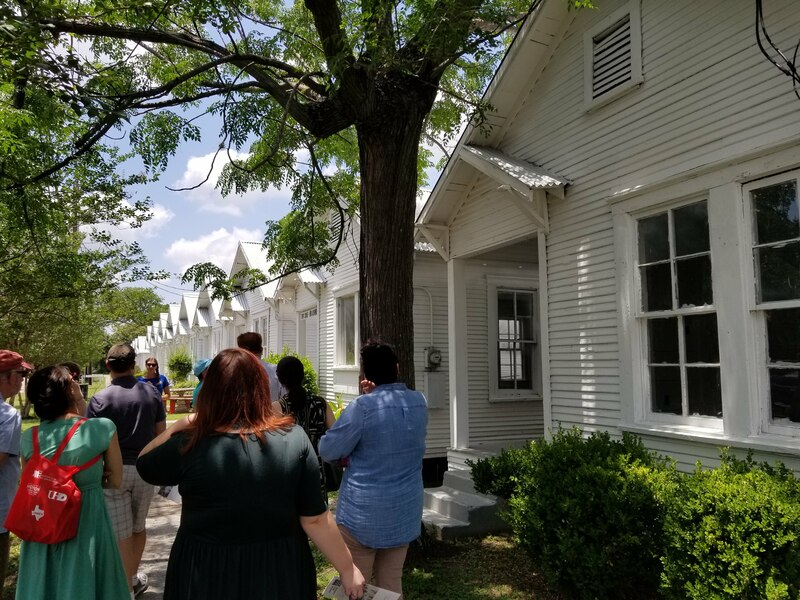 I toured Project Row Houses (PRH) in late May 2018 as part of this year’s Association of Arts Administration Educators (AAAE) conference. What most impressed me: PRH’s unwavering commitment to centering the needs of its mostly African-American community and residents (the majority of whom are marginalized due to race, gender, and income) amidst gentrification threats. 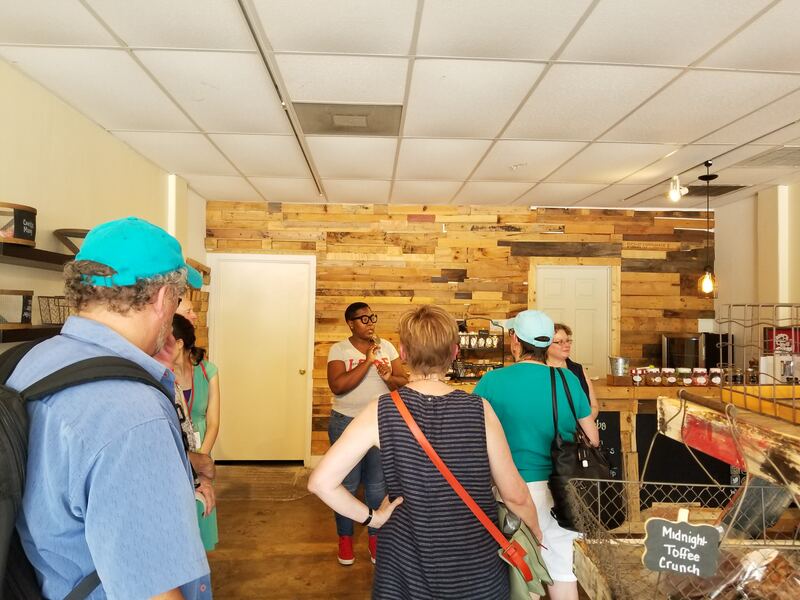 The tour included a welcome from Executive Director Eureka Gilkey and a neighborhood tour by McKenzie Watson, Guest Services and Membership Coordinator. 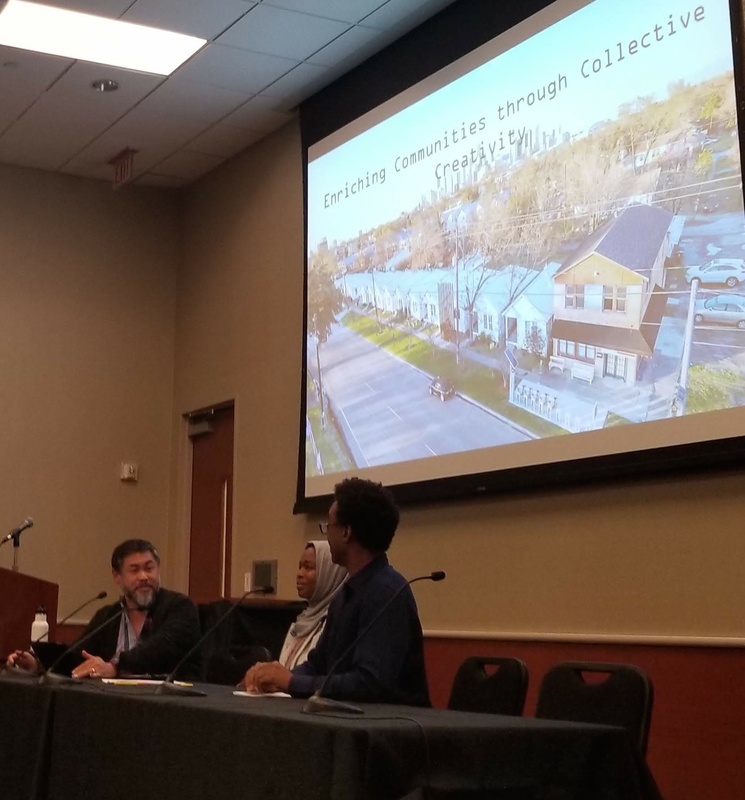 Days later, a plenary at AAAE featured an interview with founder Rick Lowe and Director of Strategic Partnerships Tamika Evans. Essential lessons from them close this post. Much has been written about arts and gentrification. Notably, sociologist Sharon Zukin researched artists in 1980s New York City lofts in then-fringe neighborhoods and Richard Florida has written about the role of the creative economy in the neoliberal growth of cities. But in these discourses, there is often an unstated link between mostly white artists who move to and make work in mostly non-white urban margins, and the role of that racial difference in sparking gentrification. Redlining not only depressed the economies of inner cities, it created an entirely new kind of people in the suburbs—the white middle and upper-middle classes. For the first time in American history, the majority of white people were living largely privatized lives in single-family homes, without many community spaces or diversity, a lifestyle that reinforced the ideal of the nuclear family, with a stay-at-home mom and a working father. When the children of that economic and cultural experiment we now call “white flight” looked around, and decided they didn’t like what they saw, they began moving back to cities. In the 1970s, New York, San Francisco, and every other major urban center began experiencing an influx of a new kind of white person—one raised with the aesthetic, economic, and spatial values of the suburbs. […] suburbanization unleashed on cities a deluge of artists who cared more about marketable aesthetics than about art that could create social change. In the 1930s, the racist process of redlining (whereby government backed home loans provided top rates to whites, and abysmal rates and denials to blacks regardless of financial healthy) racially segregated Houston, as it did in a majority of sizable U.S. cities. [See the unparalleled Mapping Inequality for more.] 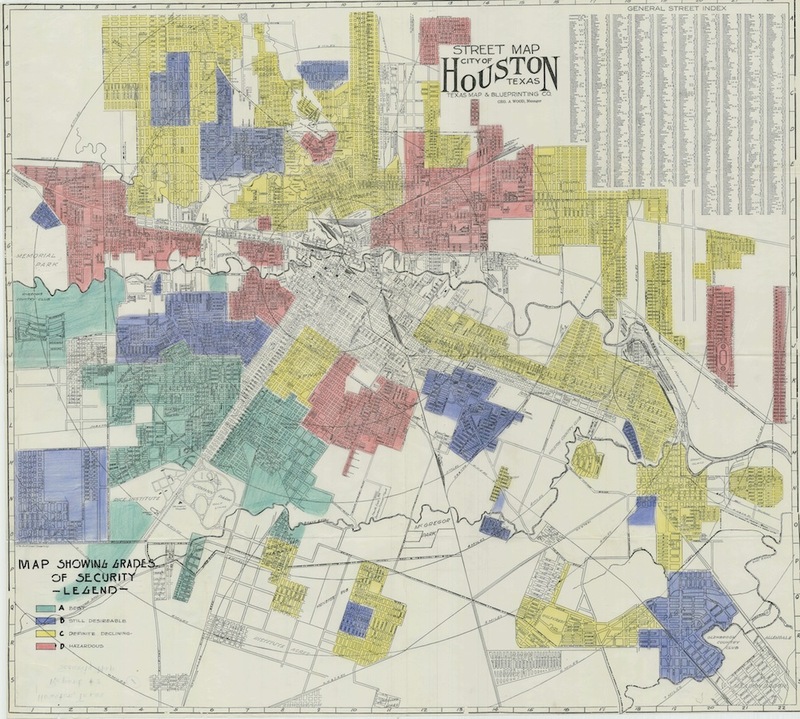 Through redlining, white bankers and governmental officials marked a majority of Houston’s Third Ward (a mostly African-American neighborhood) in red, that is, as “hazardous”; a yellow mark meant “definite declining” and delimited the remainder of the area. They did so solely due to race, because the neighborhood was mostly black. In redlining, those banks and officials denied mortgages and/or gave black residents the worst mortgage rates solely based on race, and thus divested from black people and black spaces. They also, in lining white areas blue and green, subsidized white neighborhoods with the best mortgage rates and investments. Texas Map & Blueprint Co. (1930): Street Map, City of Houston, Texas, circa 1930. http://hdl.handle.net/1911/91602. Through Moskowitz, we can make an argument linking aesthetics and race (as I’ve written about before), about how dense, redlined, and non-white urban areas that were once economically devalued due to governmental racism became, in the late 20th century, attractive to white artists who grew up in green-lined (and thus white and economically valued) suburban areas. U.S. gentrification narratives often narrowly focus on white artists entering non-white neighborhoods. Linking redlining to gentrification—whereby the presence of white artists in non-white neighborhoods attracts neoliberal capital and in turn displaces existing residents of color—then, more robustly animates how aesthetic and racialized values have been differently attached to white and black bodies because of past and continued racialized urban investments, and frames work by existing residents to confront dehumanizing neighborhood change. Now a neighborhood of 15,000 residents, Houston’s Greater Third Ward currently has a population that is about 64% black. From 2000 to 2013, home values nearer downtown have risen over 176%, displacing many long-time residents. 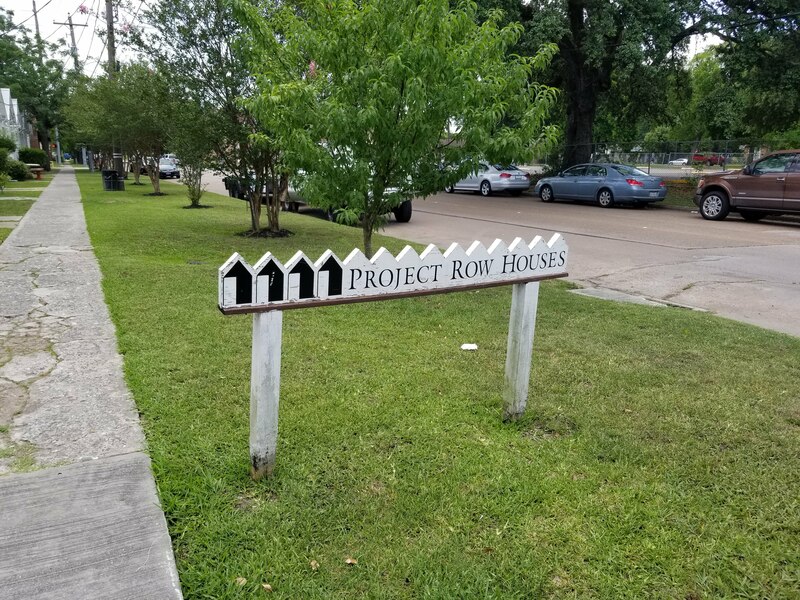 Project Row Houses centers historic and existing black residents, and humanizes those made most vulnerable by contemporary neoliberal development, and past redlining. From my tour, I learned that it does so in at least three ways. -Preserving housing stock. 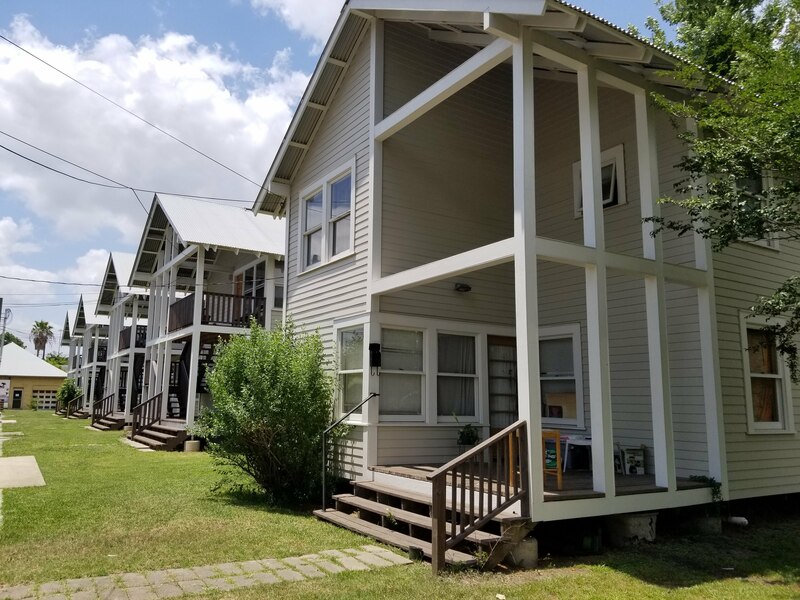 PRH started one of the first affordable housing programs in the neighborhood and more recently purchased 20 units from a slumlord, renovating them to become safe and quality places to live. -Bringing back small businesses along Emancipation Avenue, which runs by Emancipation Park. Emancipation Park is the oldest park in Houston and in Texas. Bought in 1872 by former slaves who pooled together $1,000, the park celebrates Juneteenth, the day commemorating the emancipation of slavery in Texas on June 19, 1865 (two years after the Emancipation Proclamation). 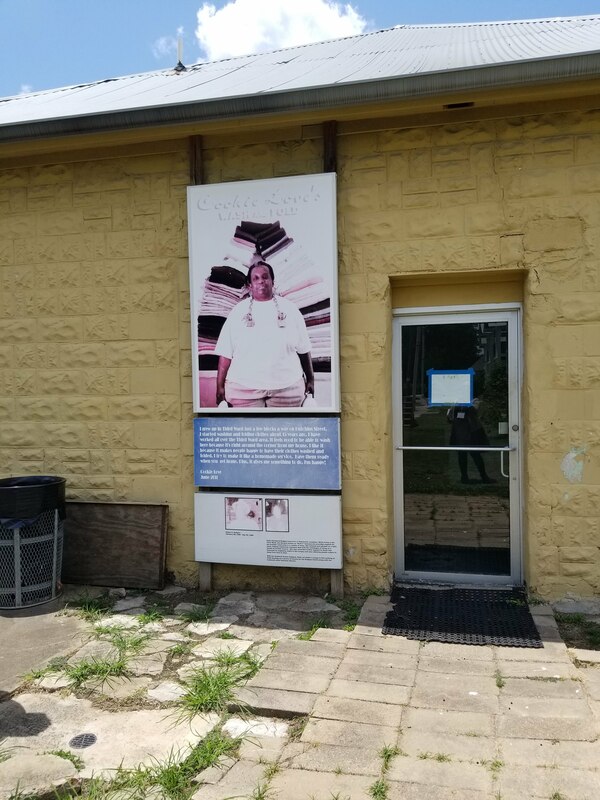 In the 20th century, Emancipation Avenue had myriad of black-owned businesses that acted as a refuge for black residents denied entry into mainstream businesses elsewhere in Houston. In the past few decades, real estate prices have jumped from $5/sq. ft to $100 sq. 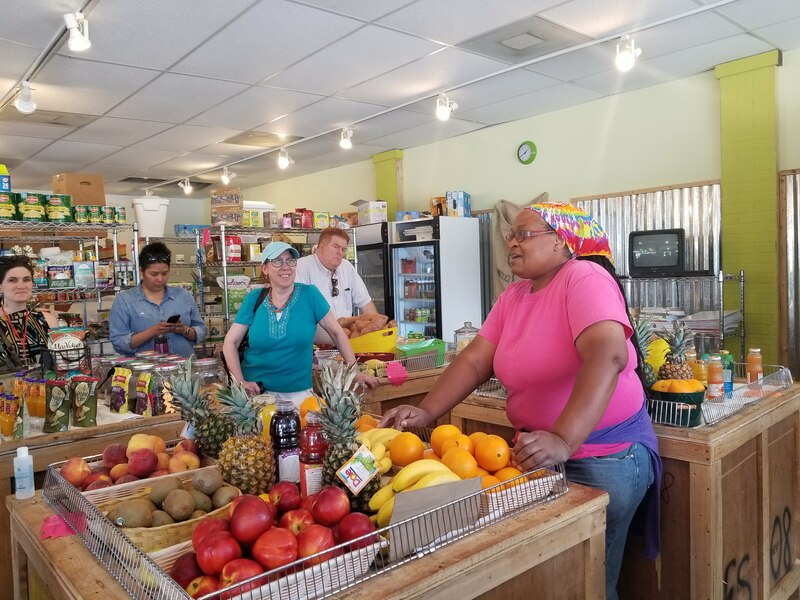 ft. PRH has helped to anchor small businesses including NuWaters Co-Op, a food market. -Working with University of Houston and Texas Southern University, universities located in the greater Third Ward, to hire residents who live in their zip codes. -Using the majority of their annual budget of $2.6 million (which is mostly foundation funded) to sustain these structures. Ultimately Gilkey emphasized how the work of Project Row Houses recognizes the complex the racial and classed effects of gentrification, and fights against how long-time residents have been displaced without recourse and resource. She detailed city policy issues, including the fact that if you are a renter in Houston, you cannot be part of your neighborhood’s civic organization and are threatened by same day eviction. 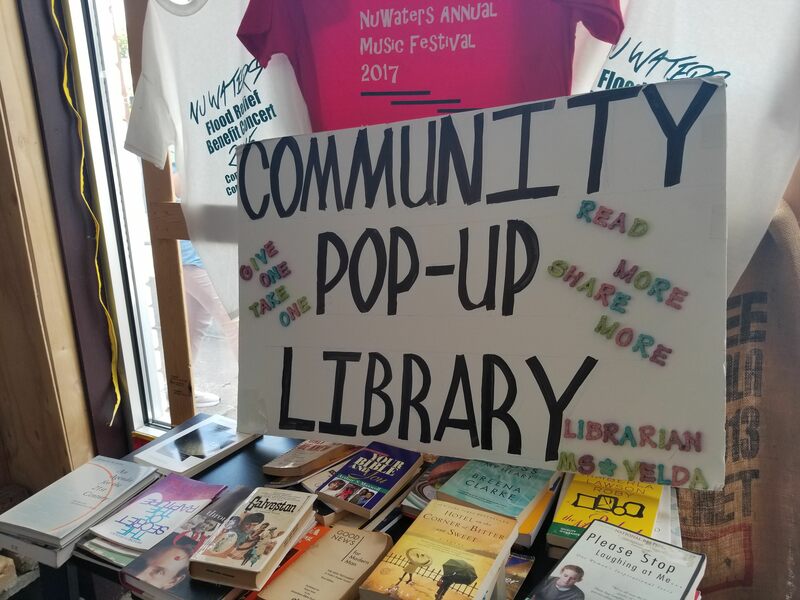 However due to PRH’s community-engaged work, by 2018 some 22% of land in the neighborhood was owned by non-profit and churches, organizations that do not adhere to capitalist development plans. 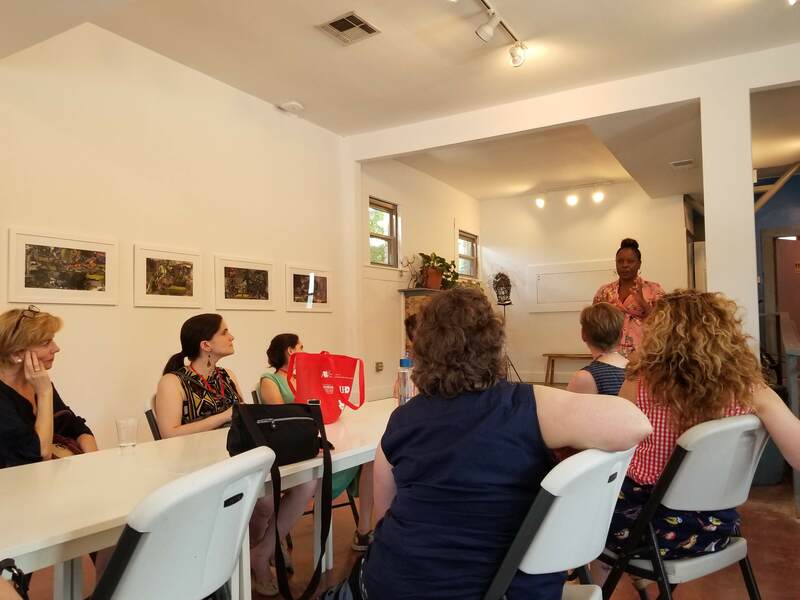 –Small Business Incubation: “PRH’s Incubation Program provides space, time and/or mentorship to artists and creative entrepreneurs working in the early stages of project development. 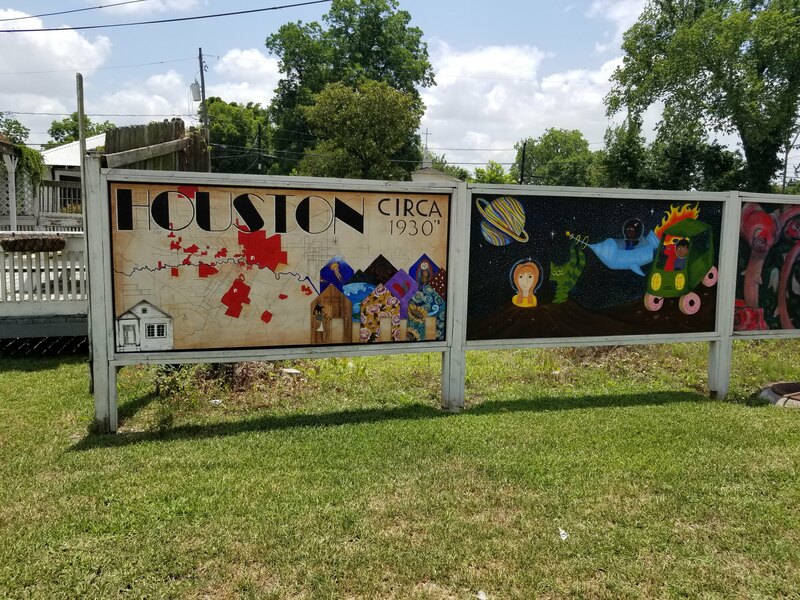 The incubation program affords creative entrepreneurs the opportunity of operating within a close-knit community of artists and activists in addition to operating on a neighborhood level with members of the Third Ward community and beyond.” Many businesses are begun by former PRH residents. 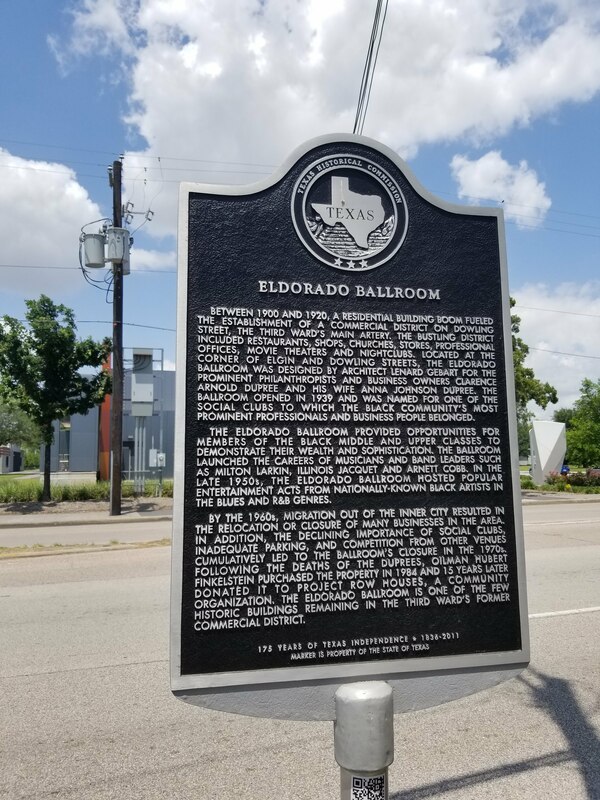 Many incubated businesses are near Eldorado Ballroom, owned and renovated by PRH, the historic home where 20th century black audiences, denied from white-only theaters, were able to see traveling black musicians. -Space for Art: From Public Art, to Residencies, to low-cost studio space, PRH is spatially thread by and led by art. 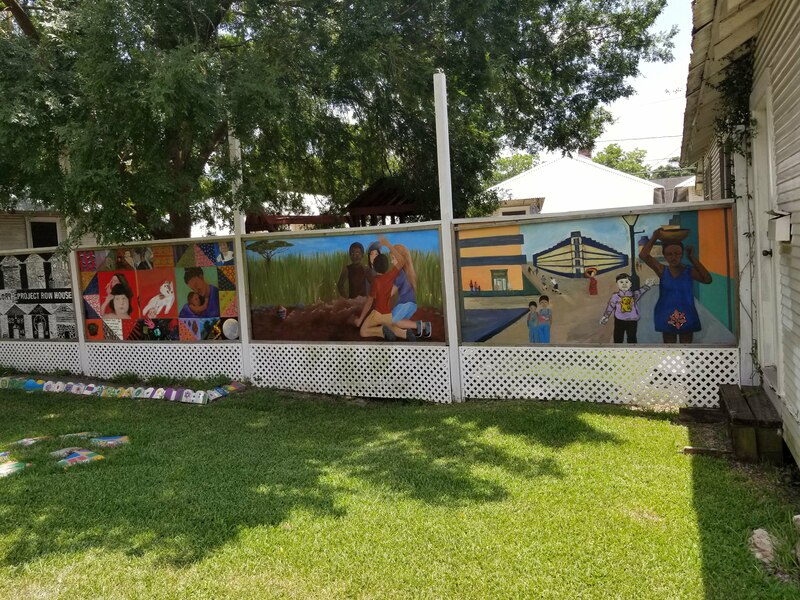 I was doing big, billboard-size paintings and cutout sculptures dealing with social issues, and one of the students told me that, sure, the work reflected what was going on in his community, but it wasn’t what the community needed. If I was an artist, he said, why didn’t I come up with some kind of creative solution to issues instead of just telling people like him what they already knew. That was the defining moment that pushed me out of the studio. At the plenary Rick Lowe also made us think about the relationship between art and the community, even admist neoliberal displacement, saying “in a market economy, we exercise our role in the market as well,” “you loose things when you scale up,” “as an artist, you make something and you think about it,” and “having an expansive mindset integral to the whole thing.” Lowe suggested framing residents as artists, as those with expansive and creative mindsets, is integral to the work that Project Row Houses does. 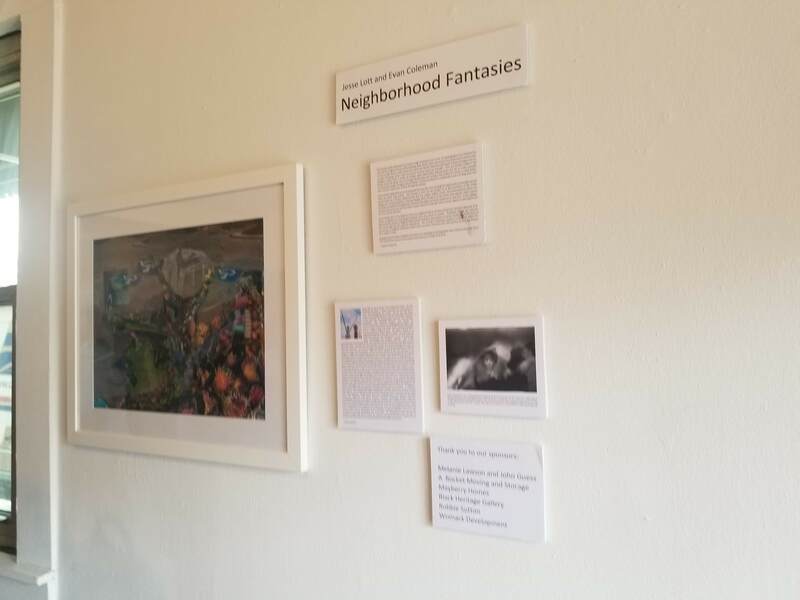 By thinking artistically, by working artistically in its neighborhoods, Project Row Houses makes an expansive space for its community and confronts the spatial dehumanization of black people. Especially in urban processes like redlining and gentrification, black people aren’t given multitudes of meaning. They are just marked in redlines as “hazardous” or through development as “to be displaced.” By contrast, Project Row Houses has allowed for multitudes of meaning to be re-attached to black residents from animating Emancipation Park, to housing single mothers, to making space for black businesses, financial aptitude, and of course, art. Unless otherwise noted all images are by Jasmine Mahmoud. 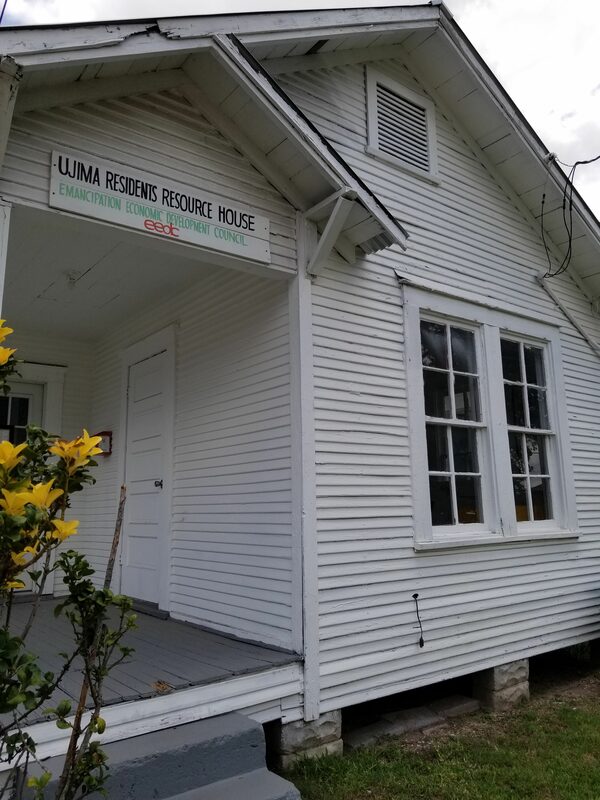 This entry was posted in 20th century, 21st century, A Brief Building History, Activism, City Planning, Creative Economy, Gentrification, Houston, Parks, Philosophy of the urban, redlining, Sharon Zukin, Uncategorized by jasminemahmoud. Bookmark the permalink.